in the video: There was a loud sharp boom – my first thought was gunshot – but I quickly realized it wasn’t. Poor Ice, however, reacted instantly. 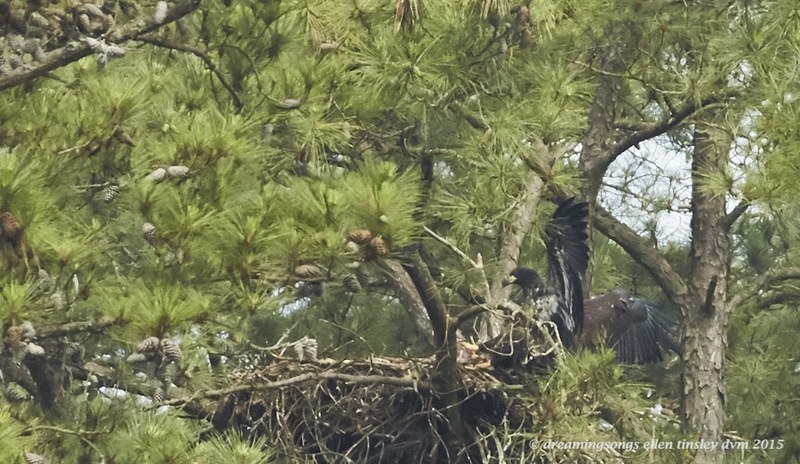 He had been perched about 600 feet from the nest when the sound occurred. It took him about 6 seconds to get back to the place that was safest – the nest. He was still nervous when he got there and showed it by picking at food and constantly looking about. Notice how he cues in on the small bird passing by. Finally Ice leaves and ends up on the perch where he had been when the disturbance occurred (not shown in the video). In the photo below Ice is making the landing at the safety of the nest – a landing worthy of his parents! Posted in eagle parents of New Hope, Eagles of Jordan Lake, Jordan Lake, photography, raptors, wild birds and tagged as American bald eagle, bald eagle, bald eagle fledgling, bald eagle flight, bald eagles of Jordan Lake, eagle, eagles of Jordan Lake, immature bald eagle, immature eagle, Jordan Lake, raptor.